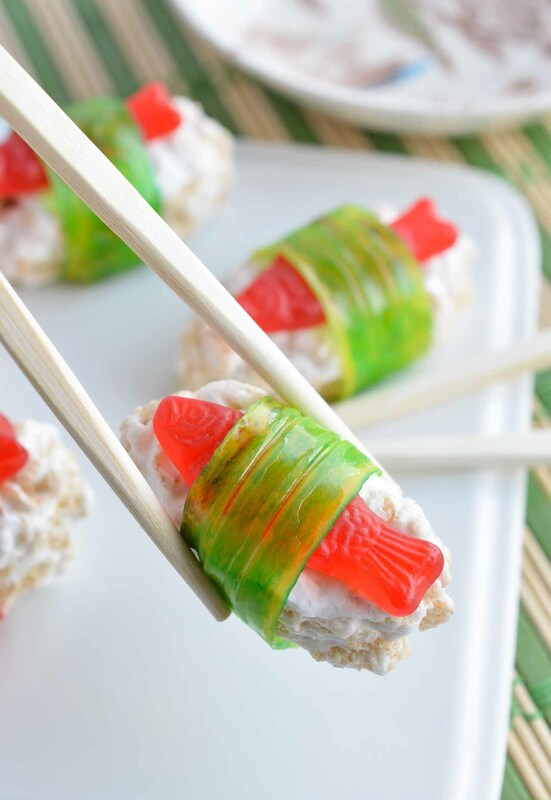 The kids will go crazy for this Candy Sushi! Made with rice crispy treats, Swedish fish candy and fruit roll ups. This dessert sushi recipe is easy to make, portable and great for parties. 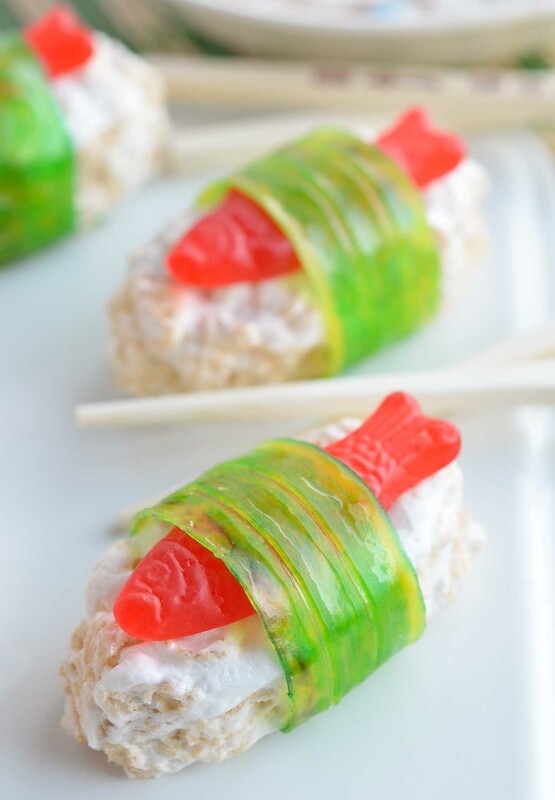 I made these fun Candy Sushi treats for my daughter’s school birthday dessert. My daughter is quite a character . . . she loves sushi and doesn’t like cake! So this was the perfect birthday treat for her. But, all the kids in her class went CRAZY over these little dessert sushi! So much so that the teacher requested more for a special school activity. Basically, these are perfect for anyone who loves sushi. 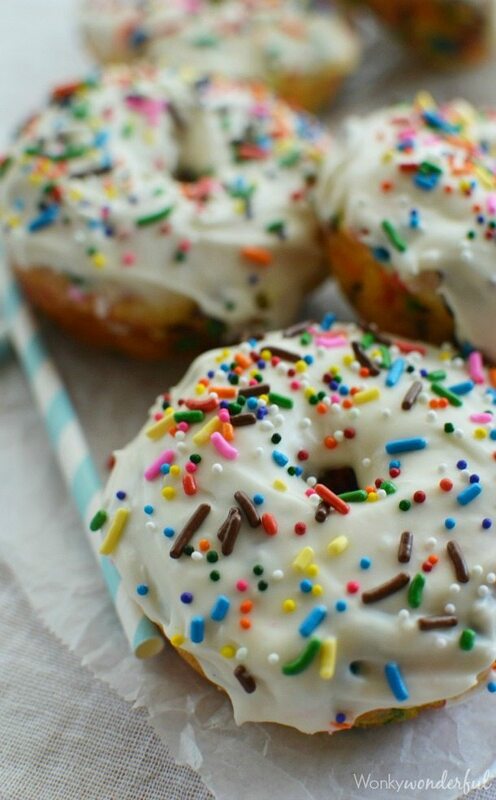 Or if you are looking for an easy unique treat, these are it. 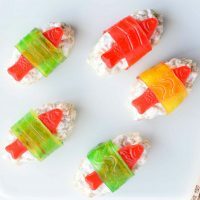 It’s as simple as making Rice Krispies Treats and forming them to look like Nigiri Sushi rice. Then top with a Swedish Fish candy and a strip of Fruit By The Foot. My secret to the ultimate soft, gooey crispy treats are Jet-Puffed Jumbo Mallows. GO JUMBO!!! Aren’t they just the cutest!?!? Trust me, everyone will think so. If you have a weird kid that licks the frosting off the cupcake then chucks it into the trash . 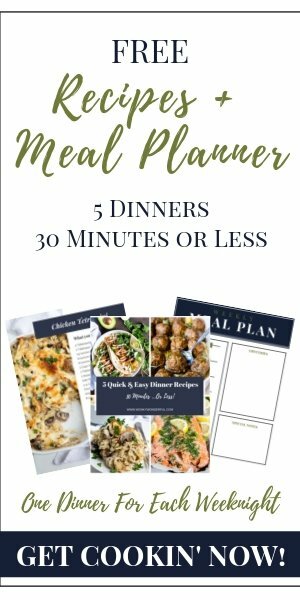 . . give this birthday treat a try! 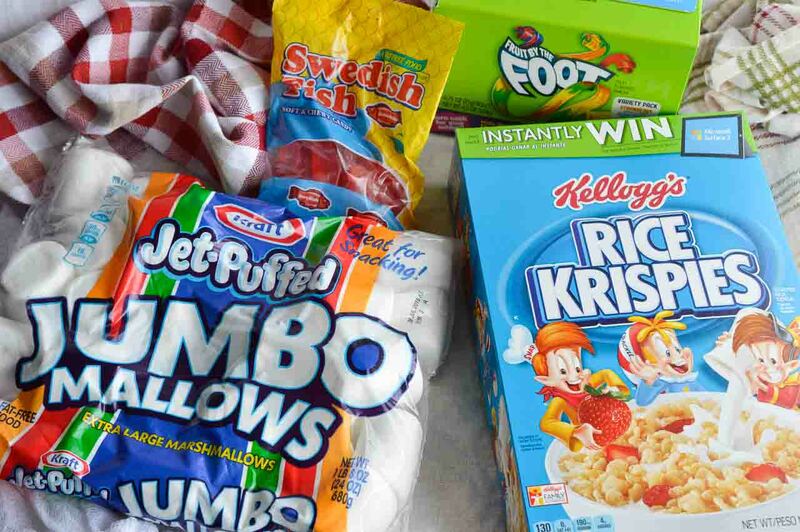 What kid wouldn’t want Krispie Treats and candy in a fun shape as their birthday surprise? In fact, what adult wouldn’t want that!?!?! Prepare large jellyroll pan by lining with wax paper and generously buttering or spraying with nonstick. In extra large bowl; combine marshmallows and butter. Microwave 2-2 ½ minutes or until marshmallows have puffed up and almost doubled in size. Immediately stir in crispy rice cereal. Transfer mixture to prepared pan and using hands or the bottom of a cup, press evenly into pan. Refrigerate until cooled. 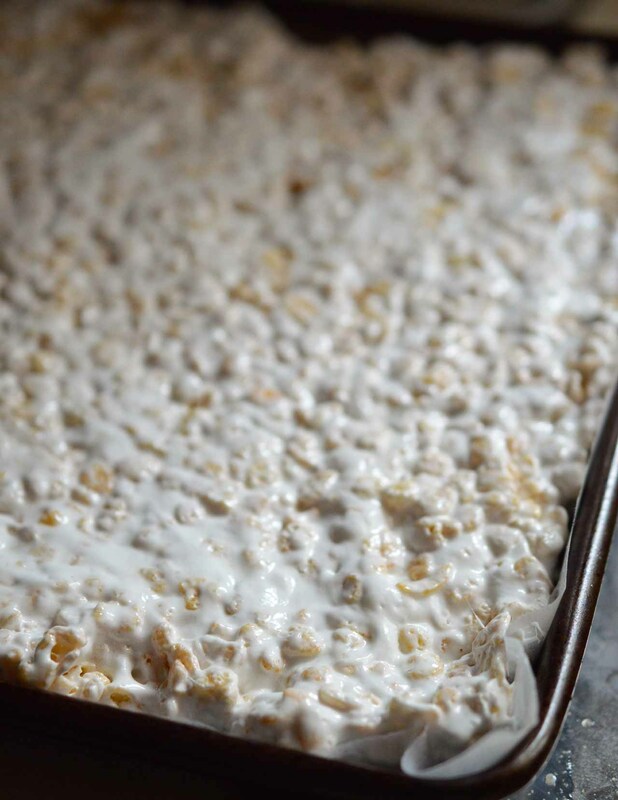 Once crispy treats are firm, carefully remove wax paper and transfer treats to cutting board. 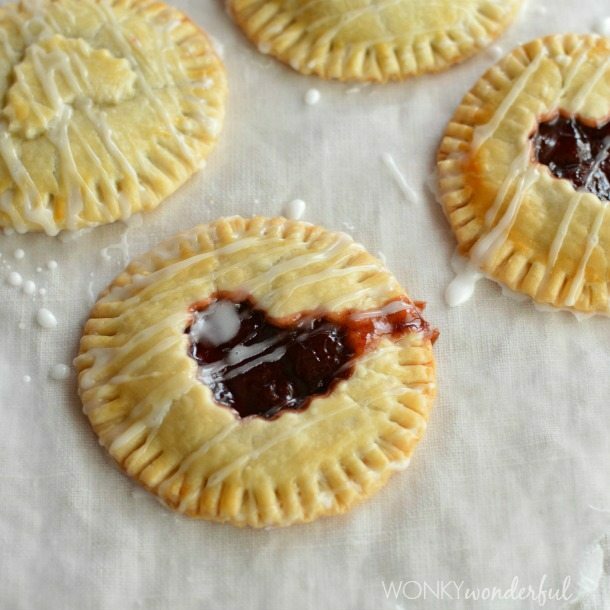 Cut treats into small rectangles (approx 3-4" in length). Form into nigiri sushi shape with hands. This should yield 30+ crispy treats. Top each crispy treat with a Swedish fish candy. Trim Fruit by the Foot into strips long enough to wrap around each piece of candy sushi. Wrap around crispy treats and fish candies. More Fun Treats. . . Thanks! 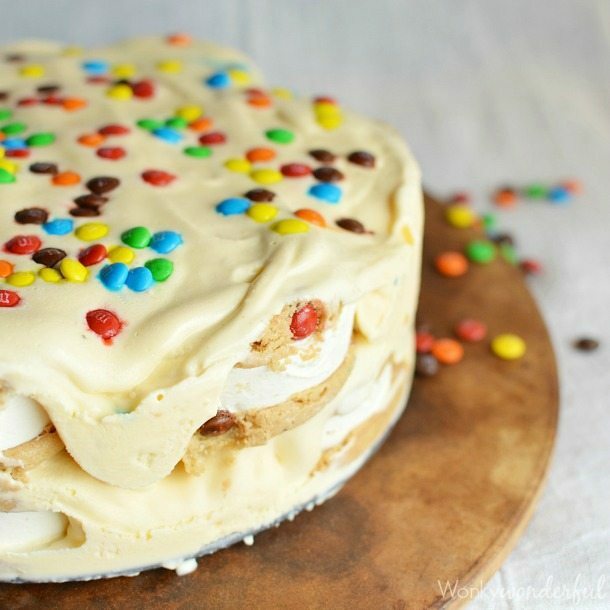 My daughter loves when I make this treat! Very clever! I love it – what an adorable treat. Thanks! It is a real hit with the kids!